This Winter’s featured ingredient is Wheat, which we will be using to make delicious hand-pulled New Year’s Biangbiang Noodles. 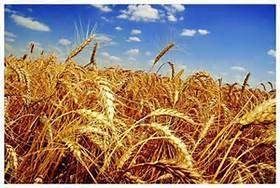 Wheat was a key factor enabling the emergence of city-based societies at the start of civilization, such as the Babylonian and Assyrian empires. It was one of the first crops that could be easily cultivated on a large scale, and stored long term. Whole grain wheat “berries” are composed of the carbohydrate-rich endosperm, oil-rich wheat germ, covered in fiber-rich bran layers. Micro-nutrients are concentrated in the germ and bran. 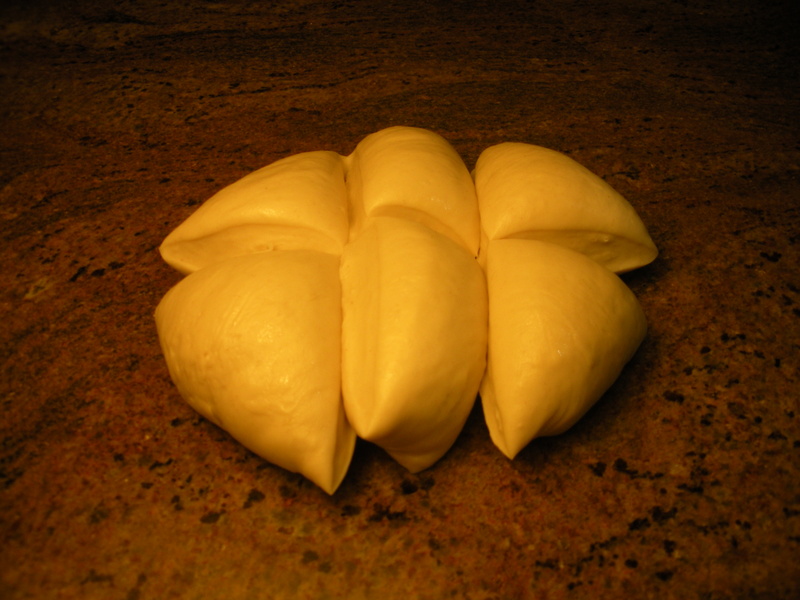 White flour is made from just the endosperm. 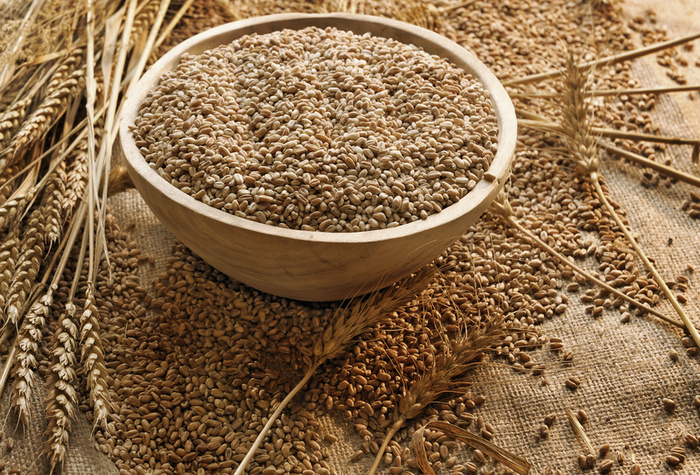 Wheat flour or sprouted wheat berries can be used to make pasta, breads, biscuits, cookies, cakes, and cereals. 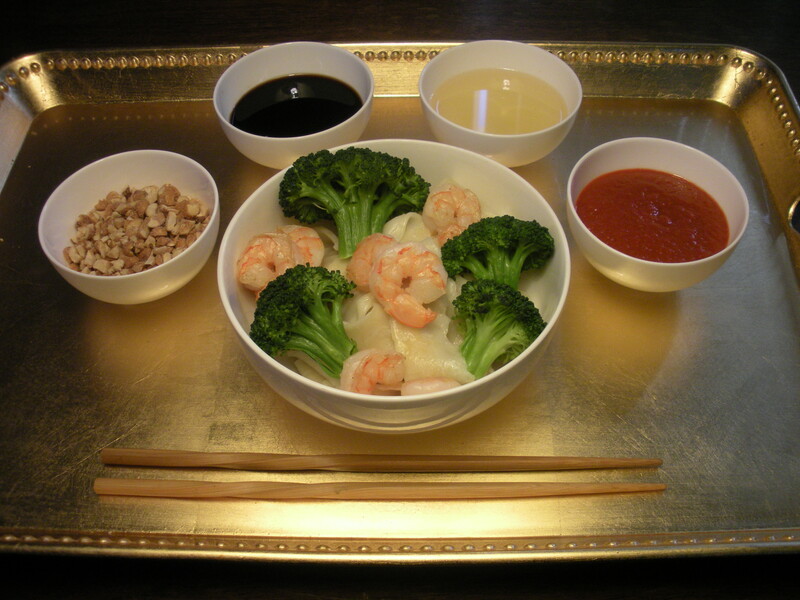 Noodles are made from unleavened flour dough, formed into a variety of shapes. While long, thin strands are the most common, noodles can also be formed into tubes, waves, helices, shells and other shapes. Noodles are usually cooked in boiling water. They are often sauteed or deep-fried, and served with a sauce or in a soup. At noodle shops, customers customize their bowl of noodles to taste with toppings, often on the table: soy sauce, vinegars, chili sauce, peanuts, eggs, cilantro, mint, pickled vegetables, and bean sprouts. 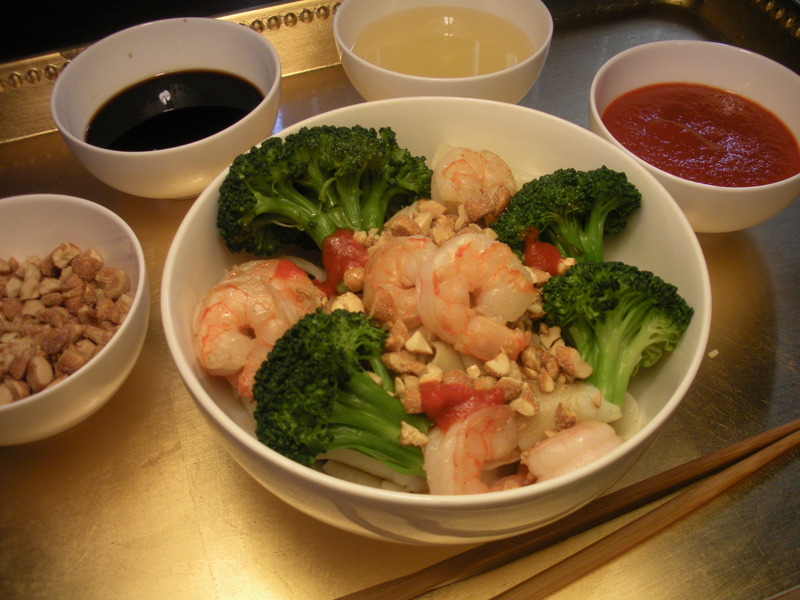 During Chinese New Year, this year beginning January 31, long noodles are eaten in all corners of China. The long noodles represent having a long life. 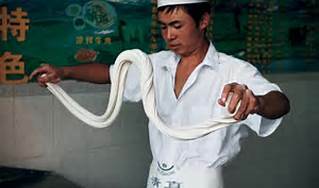 “Longevity noodles,” also served at birthday parties, are cooked and eaten whole, never cut or broken. Noodles are commonly eaten by “slurping,” sucking them into the mouth with a loud slurping sound. This Winter’s Recipe is for New Year’s Biangbiang Noodles. Our recipe is an adaptation of Mission Chinese Food’s Danny Bowien’s. 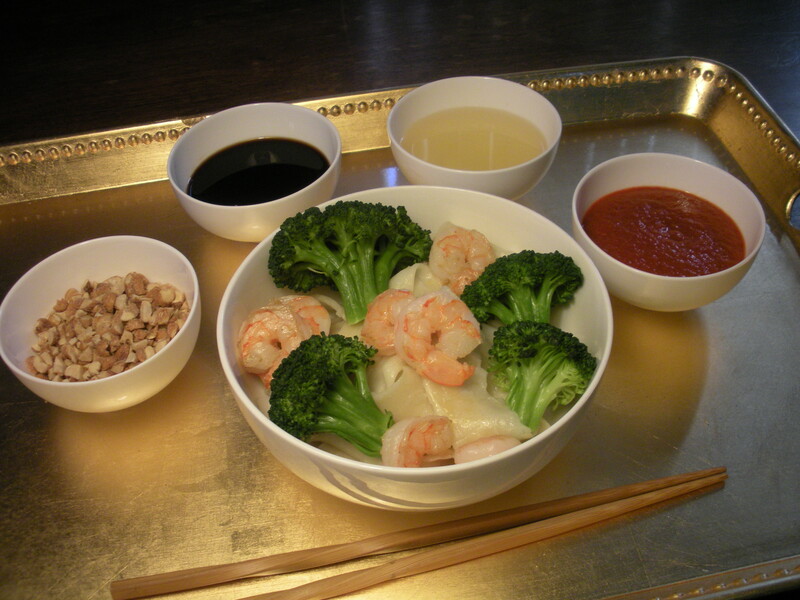 Our dish is made with a fresh shrimp (another traditional New Year’s food) and broccoli, for a complete meal in a bowl. Unfiltered peanut oil is available in most health food stores, and has a roasted peanut flavor. Liven up your New Year’s Eve or Chinese New Year with a biangbiang noodle pulling party! 1. Choose toppings (above) and place each topping in a small bowl on the dining room table. 2. Put large pot of salted water on high heat, to begin bringing to boil. Put steamer pot with water on high heat to boil. 3. 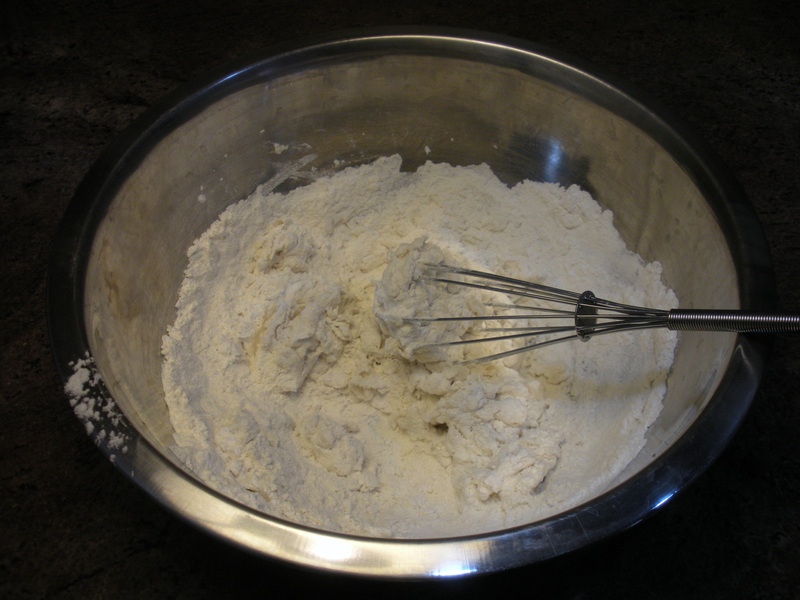 Whisk flour, salt, kansui and water together in bowl until dough starts coming together. 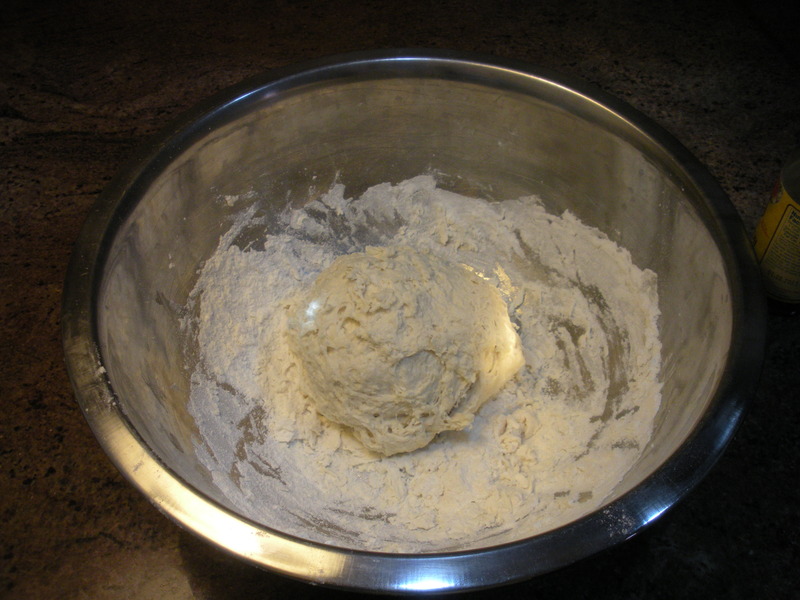 Gently knead in remaining flour to form a ball of dough. 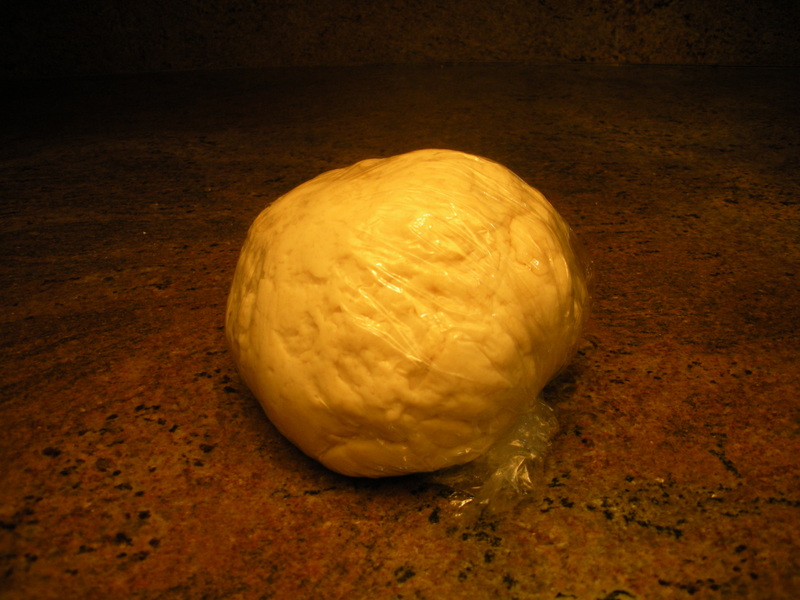 Cover dough ball with plastic wrap and let rest for ~10 minutes. 4. 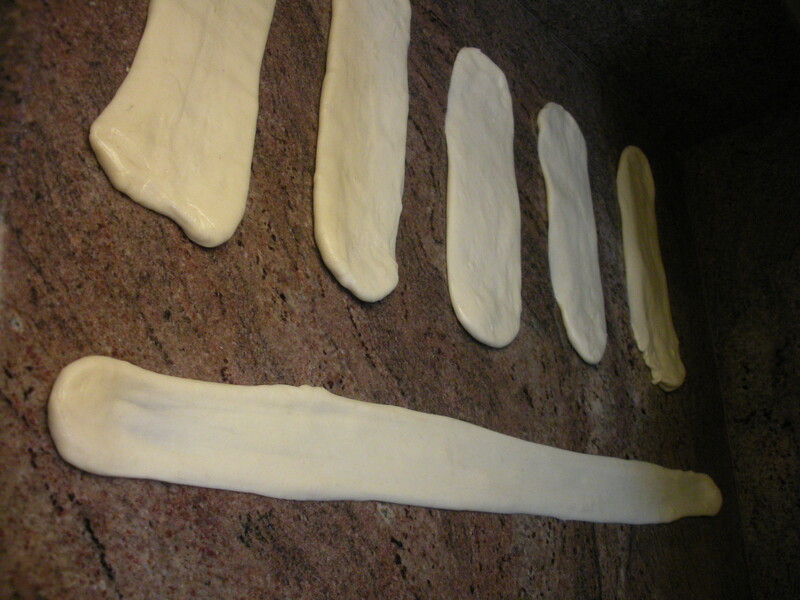 Turn dough out onto a clean counter top. 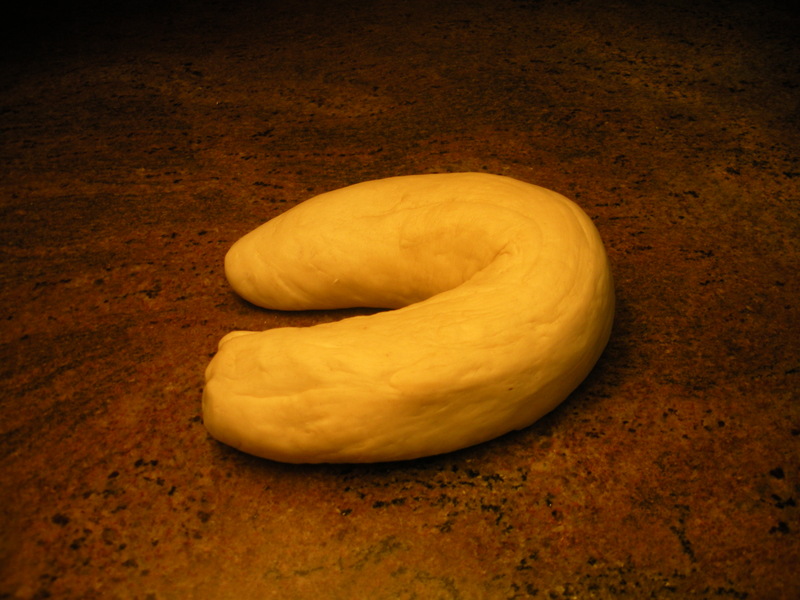 Knead and roll dough into a “log” about shoulders width. Bring ends together and roll back into a log shape. Repeat process until dough is smooth. Roll into a ball. Let rest for ~15 more minutes. 5. 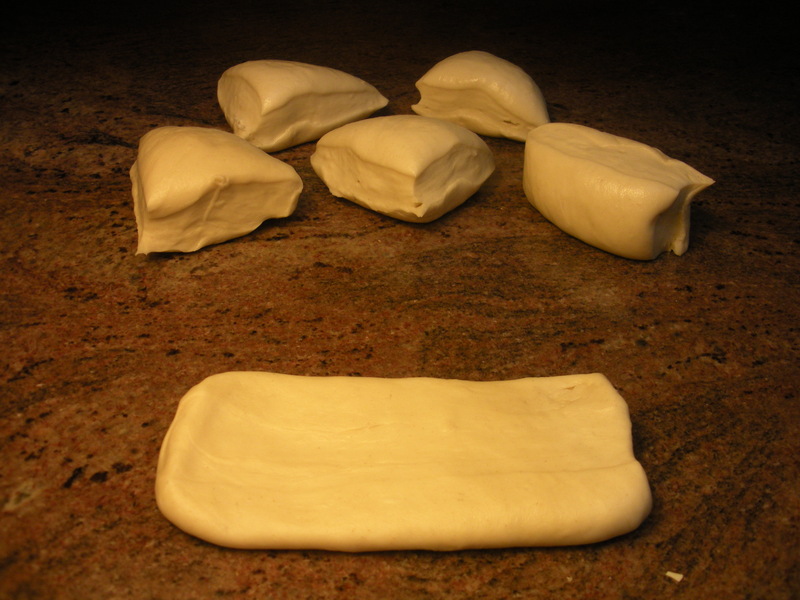 Cut dough into 6 equal size pieces. Flatten each piece into a long rectangle. Coat both sides of each rectangle with a little oil. 6. Holding the dough between the finger and thumb of each hand, start gently stretching the dough to almost shoulder width. 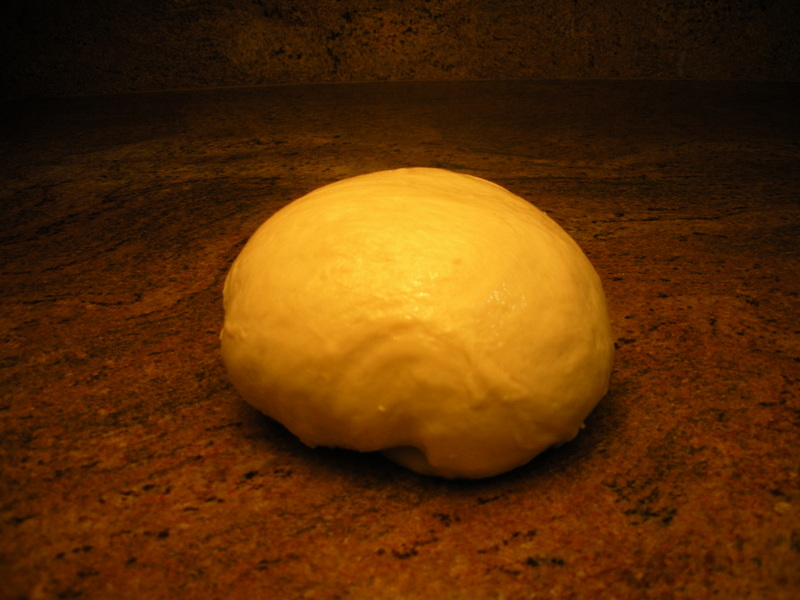 Then, begin slapping the dough “belt” against the clean counter top. The center line of the belt should be slightly thinner than its edges. 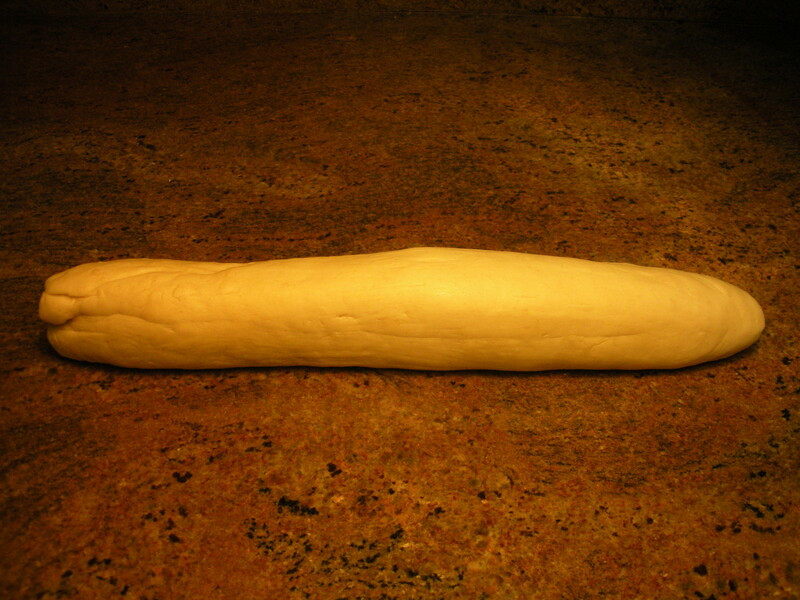 Next, tear the dough down the center, from one end to the other, leaving the joining end intact to form one long noodle. 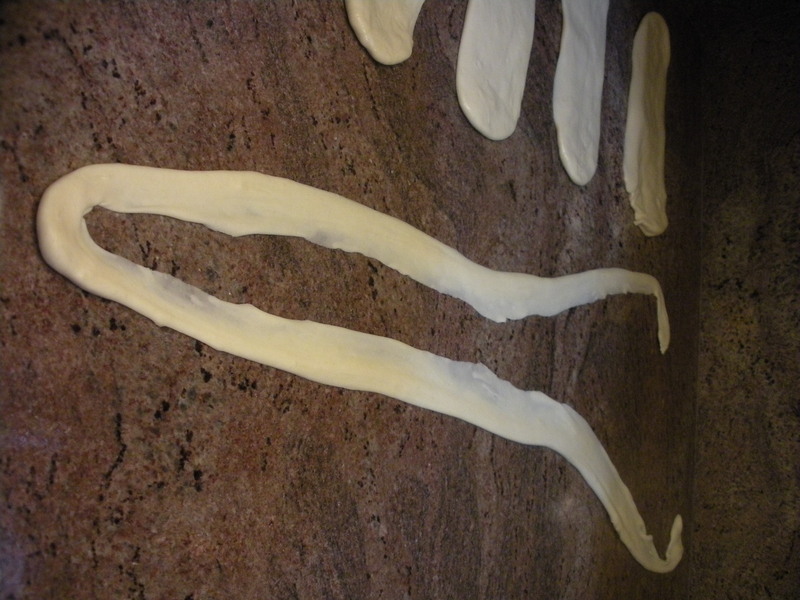 While pulling the rest of the dough, cover fresh noodles with plastic wrap to prevent from drying. 7. Place raw broccoli flowerettes into steamer pot, removing when bright green and tender. Heat pan on medium-high flame. Add a little oil. Saute shrimp until just cooked through. Remove from heat. 8. Drop fresh noodles into boiling salted water. 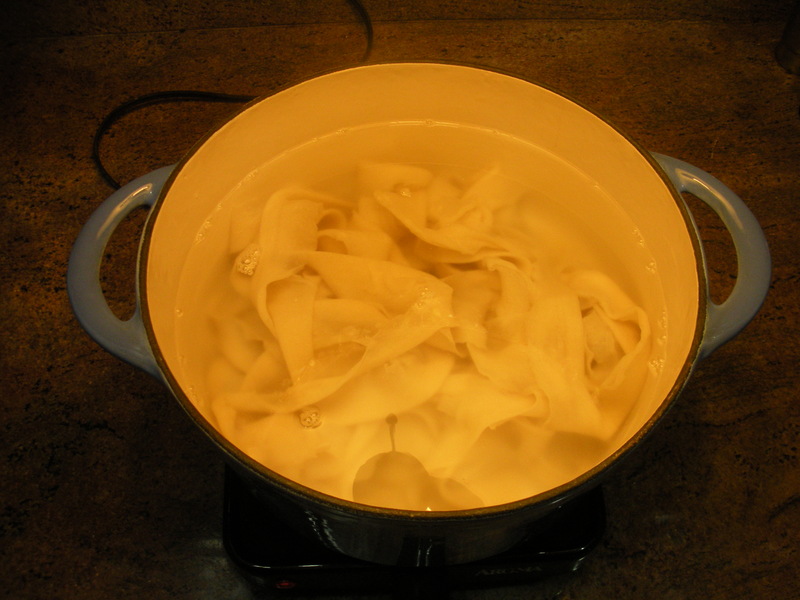 Cook noodles just until they float to the surface and are desired tenderness, ~2 to 3 minutes. Drain in colander. 9. 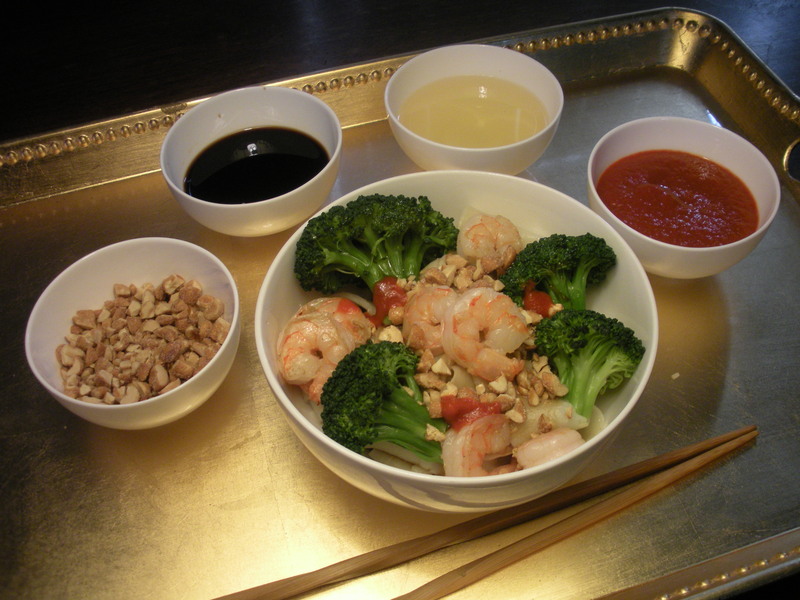 Place noodles, shrimp, and broccoli in serving bowls, and bring to table. Add toppings as desired.